Dynamic window placements and drawing on a form, simple usage of windows registry as a storage place for information. Continuing from the first article about sudoku. There we have designed the application and put a lot of user interface elements into place. Now open the project in visual studio. Note the scroll bar to the right - not nice is it. So how do we fix that? Now change the line ResizeParentToFit(); to ResizeParentToFit(FALSE); The default parameter (TRUE) will instruct the system to shrink the frame to fit but not to enlarge the frame should that be required. Changing the parameter to FALSE instructs the function to make the frame fit even if it must be enlarged. Now run it again – no scroll bar, but still doesn’t look nice. Let’s finish the layout with some code to demonstrate how one can do some things outside of the resource editor. First the buttons will be positioned to be in their 3x3 groupings. This will be done in the OnInitialUpdate of the View. Now for an SDI type application (like this) the OnInitialUpdate is called every time a new document is created or a document is loaded – we only need to position the buttons once. In the header file we will add a boolean variable to act as a flag to control this so the positioning only occurs once. This is just for neatness (efficiency) as the first repositioning will move the buttons to the correct position, any later times the code is run will not actually move them. We also want an array to hold the buttons – later we will subclass the buttons to a custom class for some owner drawing. Note I have done it before the body of the constructor – in most cases it doesn’t make any real difference if done the way shown here or in the body of the constructor. //Set the flag - prevent reentry and duplication of effort. Important. The above code uses a loop to subclass the controls on the dialog to the array of buttons. 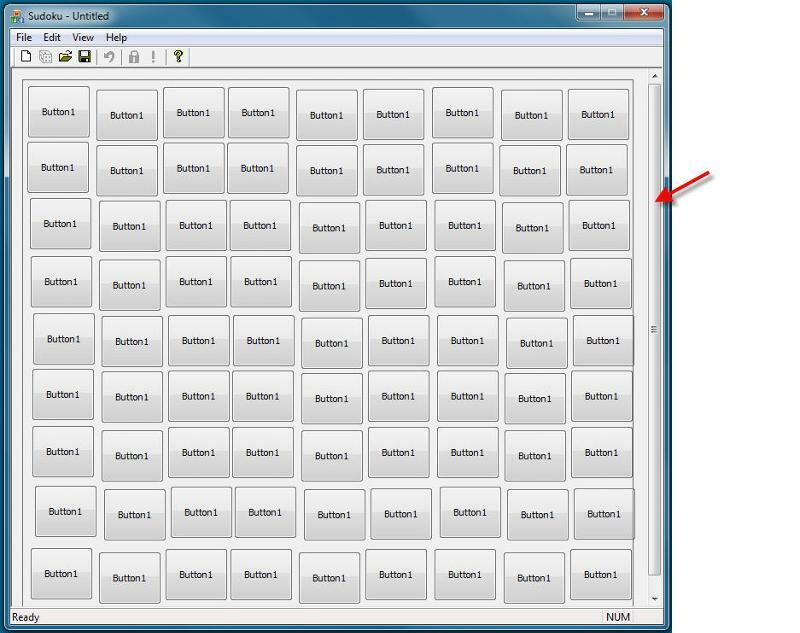 This will only work if the ID’s of the buttons are in a series – which is why they were all added one after the other in the copy/paste when using the resource editor. Now press F5 again to compile and run – we should now see a much more organised grid, looking rather like a Sudoku grid apart from all the buttons having the same text (Button1) on them. You have probably seen that the sudoku app starts at a new location in windows everytime you run it. For those of you with a multi monitor system then always on the main monitor (typically in front of visual studio – a nuisance for debugging isn’t it). Let’s make it ‘remember’ where you move it to, even if on another monitor. When the frame window is being shown initially we will attempt to read the settings from the registry, if we don’t find any then we just center the window in the main monitor. First we will comment out the final three lines (before the line return 0) concerning the toolbar – to keep the toolbar fixed in one location in our application. We also need to add #include “atlbase.h” at the top of this file (after #include “MainFrm.h”) so that the compiler knows what the CRegKey class is – this is an MFC class to provide support for the registry. Press F7 to compile and – oops, error messages. I see an Error C2664 about a CStringT…. This is our ‘mistake’ in generating the project where we kept the default setting of UNICODE. We are trying to mix ‘wide’ chars and ‘narrow’ chars (ANSI) with the strings in the code. For certain reasons not yet explained I don’t want a UNICODE based app so we need to change a project setting. Go to the solution explorer, there will be a tree view with a solution Sudoku and this contains a project also called Sudoku. Right click with the mouse on the project and select properties. You should get dialog called Sudoku Property Pages. Look to the top of the dialog and see a combobox labelled Configuration. That should contain Active(Debug) – change that to All Configurations. In the tree view at the left expand the Configuration Properties then select the General node. To the right you should see a number of settings, fairly close to the bottom is Character Set, change that from ‘Use Unicode Character Set’ to ‘Use Multi-Byte Character Set’ then click the Apply button. Have a browse through the settings available – this is command central for how the applications code is converted into the exe (dll…) by Visual Studio. Pathways for libraries and other files, predefined variables, ability to run programs before and after compilation, well way too much to describe here. We have updated the project with the apply button so now hit cancel – just in case you accidentally made a change to something else. Now try to compile again (F7 key) and now it should compile without error. (Sometimes I see a general error about the manifest – it seems to to be Visual Studio not behaving properly, just press Ctrl+ Alt+ F7 <note the Ctrl and Alt keys – this forces a complete rebuild> and it will compile properly this time without error). If you ran the application it should at least display at the same location each time – now to store the position when the app is closed. If you compare the code in the ReadWindowPlacement and WriteWindowPlacement functions you should see a lot of similarities. The size and location of the application is converted to a string then stored in the registry when the application is closed. When it is started the values are read from the registry as a string, parsed into the WINDOWPLACEMENT structure and used to position the application where it was last time. HINT: If you don’t understand a (windows) function select it with the cursor then press the F1 key. The help file should start with the help about that function. Read it and the options / default settings. Failure to do that is a source of numerous questions here at EE, and think just how much quicker it is to do that than to ask a question. If you don’t understand the help then you can still ask a question for more explanation about the part you don’t understand. Press the F5 key to compile and run. Move the Sudoku app somewhere then close it. Run Sudoku again and it should start where you last closed it. We have moved window elements (buttons) into the place we want using code. We have modified the settings for the solution - settings about how the source code of the app is compiled and linked. We have used the registry to store information for positioning the main window where it was located the last time the app was run. There we used the project wizard to create a new application skeleton. We also started using the resource editor to modify how the compiled application would look. There we will be looking at loading and saving to file on disc. We also look at the interaction between the document and the view in the application architecture.